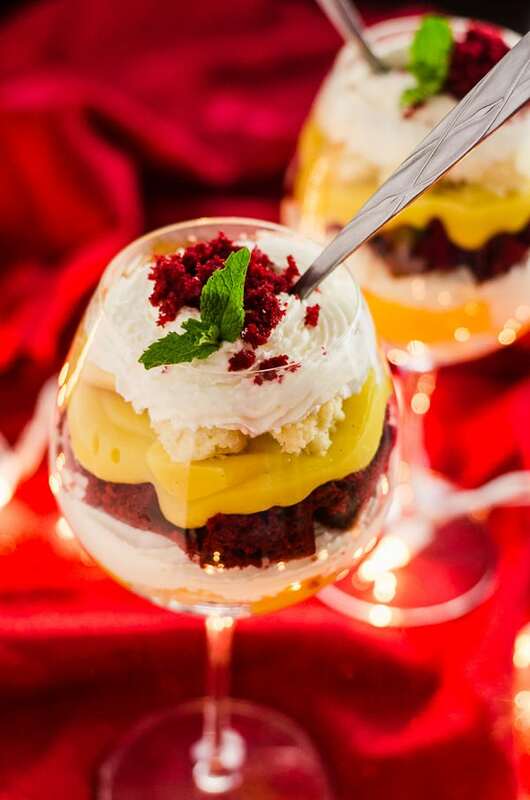 Red Velvet Eggnog Cheesecake Trifle is a quick, easy, stunning last-minute dessert, made with festive red velvet cake, fresh eggnog pudding, and horchata-spiked whipped cream! Everything I do lately is last minute. I’m a procrastinator by nature (and I hate it, trust me,) but I feel like ever since Thanksgiving passed, I’ve just been going through my days on negative time. Someone call Hiro, or Doc Brown, or Doctor Who (preferably Ten) – I need a man with a time machine that can help me out! By this time of the month, this close to Christmas, I’m usually done with all of my holiday baking, save for whatever dessert goes to dinner on the 25th. I haven’t even cracked open Nana’s cookbook. Not even any dough in the freezer, ready to go. This week’s #SundaySupper is themed for those of you who are just like me – Last Minute People, in need of quick and easy recipes to take to those parties you almost forgot about. 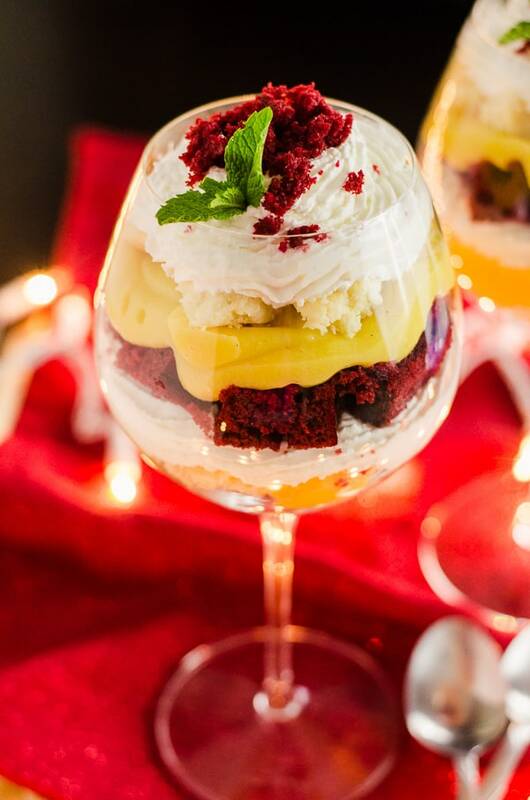 Thank heavens for Google calendar reminders, and simple desserts like this Red Velvet Eggnog Cheesecake Trifle! 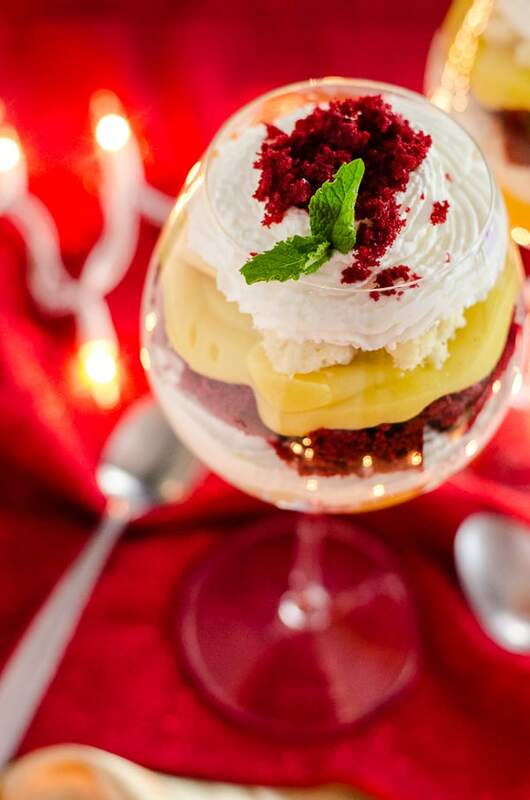 JUST TAKE ME TO THE RED VELVET EGGNOG CHEESECAKE TRIFLE ALREADY! If you’d rather skip my (pretty darn helpful) tips and tricks, essential cooking info, and similar recipe ideas – and get straight to this deliciously easy cheesecake trifle recipe, just scroll right on down to the bottom of the page where you can find the printable recipe card! Trifles are the easiest pseudo-cake you could ever hope to impress your guests with. I promise. All the delight of a slice of cake, without having to cut it! I can guarantee that the hour or so you spend on this dessert will be totally worth it. I portioned the recipe out into (rather ridiculously generous) “single-serve” wine glasses, but the components can easily be doubled to fit a larger trifle bowl. My original plan was to go with a trifle bowl, to show how party friendly the recipe is. Buuuuuuuut guess what?! I don’t own a trifle bowl. I was just as shocked as you probably are right now. And, of course, Last-Minute Me didn’t have time to go out and buy one to get this dessert made in time for the Christmas party I went to on Sunday night. Into the wine glasses it went, although I feel that they served it pretty well. Except…we didn’t share any of these. We enjoyed some leftover broccoli cheddar soup, and then savored the blend of flavors in these trifles, spoonful by spoonful. Sorry, friends. Put me on your shopping list for a trifle bowl, and maybe next year, this will show up at the party. Following directions on the box, bake the red velvet cake in a 13x9-inch pan. Allow to cool, then cut into ½-inch cubes. Carefully cut frozen cheesecake into ½-inch cubes. Refrigerate until ready to assemble. In a medium bowl, combine pudding mix and eggnog and whip for 2 minutes. Refrigerate until ready to assemble. In a large metal or glass bowl, combine heavy cream, sugar, vanilla, and horchata. With a hand mixer, whip until medium peaks are reached. Line up 6 clean wine glasses side by side in your workspace. Lay down a single layer of red velvet cake cubes on the bottom of each, then a layer of cheesecake cubes. Using a piping bag or long spoon, layer about ¼ cup of pudding on top of cheesecake. Pipe a layer of horchata whipped cream on top of pudding. 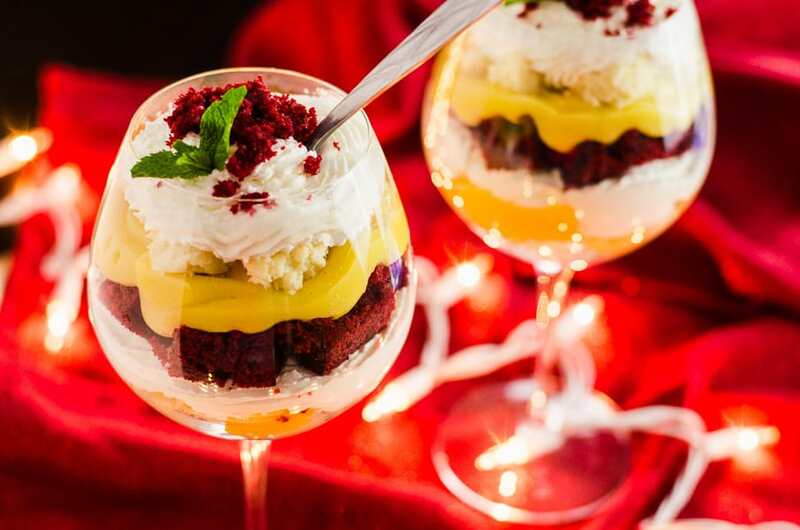 Set another layer of cake cubes, another ¼ cup of pudding, a layer of cheesecake, and top it all off with more whipped cream, piping it up and out of the glass. Garnish with crumbled red velvet cake and a spring of mint. Enjoy! You will have leftover cake and cheesecake if you're making the 4-serving recipe. To double, use 2 boxes of pudding mix + 4 cups eggnog, and double the whipped cream recipe. PIN THIS CHEESECAKE TRIFLE FOR LATER! In need of more last-minute holiday inspiration?! Stop by my other #SundaySupper crew’s blogs and take a look at what they love to serve to their guests! This is really so simple but so beautiful! I think the wine glasses were the perfect way to serve this! I just started my cookie baking—I can totally relate. 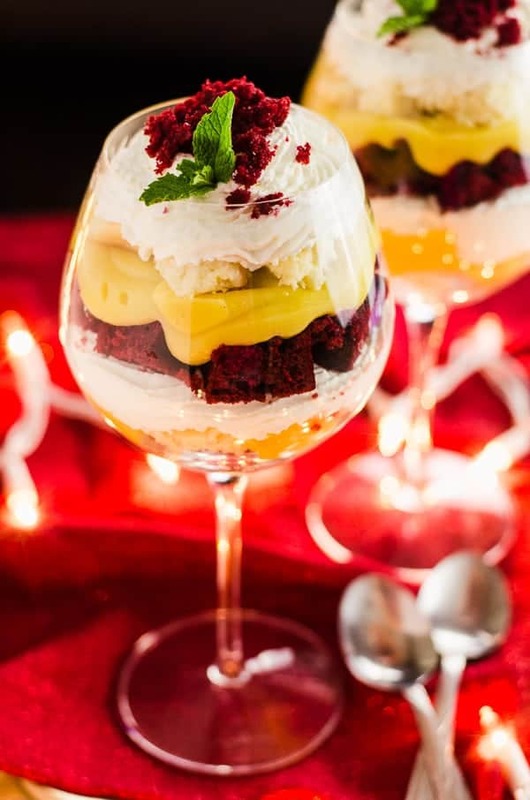 Your trifle looks like a million bucks and I love the presentation in goblets (though my fingers are crossed that you’ll have a trifle bowl by next Christmas :)). I am a sucker for ANYTHING red velvet! 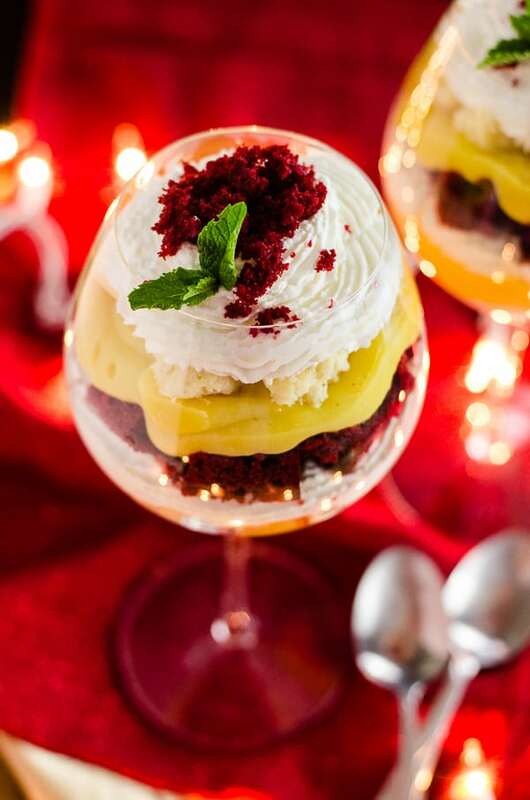 This trifle looks like a perfect dessert option! I love both the color and flavors in those trifles. So festive and pretty for the holidays.